It was our turn to have the family over for Easter dinner today. 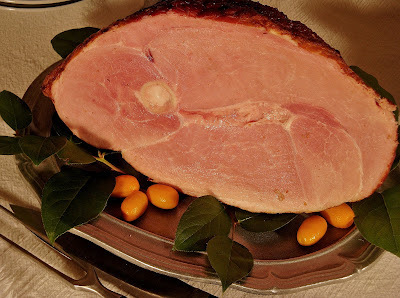 Since I needed to prepare everything quickly after coming home from church, I decided to serve my favorite ham, a Kurabuta from Snake River Farms. These hams come from Bershire hogs, a heritage breed that was “discovered” 300 years ago by Oliver Cromwell’s army, in winter quarters at Reading, the country seat of the shire of Berks in England. (They were “discovered” in the same way that Columbus “discovered” America – the people who lived in Berkshire obviously already knew about them.) The word spread about the wonderful hogs of Berks that produced hams and bacon of exceptional quality and the Reading Fair became famous as a market for pork products. Bershire hogs were taken to Japan in the 1800s where they were called “Kurabuta,” which means, “black pig,” in Japanese. Most people have no idea how good an old-fashioned, natural ham tastes. It is dark, succulent, and rich, unlike modern pork, which is pale, dry, and bland because it has been bred to be as lean as possible; it is so lean that it must be injected with sugar and chemicals to make it palatable. I bought my ham at my local Central Market. I bought it early because they only stock them for holidays and sometimes they run out. I plan to check back later this week because if there are any left, they may be marked down and I can get another one to put aside for later. Our meal started with a chicken liver pate with raw veggies and we had sliced tomatoes, Fennel Baked in Cream, and French Style Peas as side dishes with the ham. Dessert was my Lemon Icebox Pie with Whipped Cream. (The recipes for the pie and the peas are from Nourished.) I’m still too full to think about food, but I’m looking forward to a little cold ham and another slice of pie later this evening. NOTE: Snake River Farms lists sugar as an ingredient in their hams, but gives the carb count as zero, which means it has less than 0.5 grams per serving. Their products are available in restaurants nationwide and in stores on the West Coast or online from www.snakeriverfarms. Disclaimer: I have no affiliation with and have never recieved any compensation from the company mentioned in this article. Thanks, Jennifer, indeed we did. Hope yours was equally wonderful.